Another adventure right at the start, half of our luggage did not make it onto our plane! It always takes a little spice and stress to be set-up and ready for a mission! 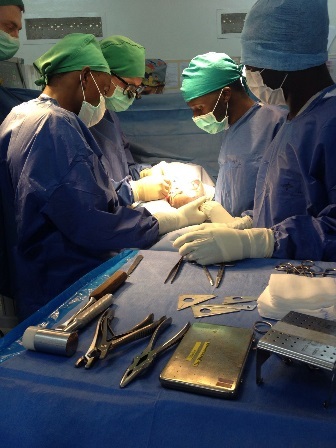 The March mission was primarily devoted to orthopaedics. 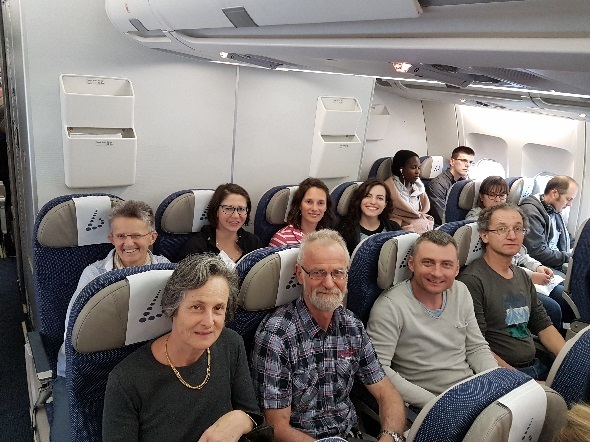 The team was led by Dr. Georges Kohut and supported by anaesthetists Dr Katrin Flueckiger and Géraldine Bégué and instrumentalist nurse ( scrub-nurse) Kastriota Kastrati. In addition to the operating team itself; the expertise provided by Dr. Rémy Boscacci was invaluable in view of the large number of cases of infection, and osteomyelitis. 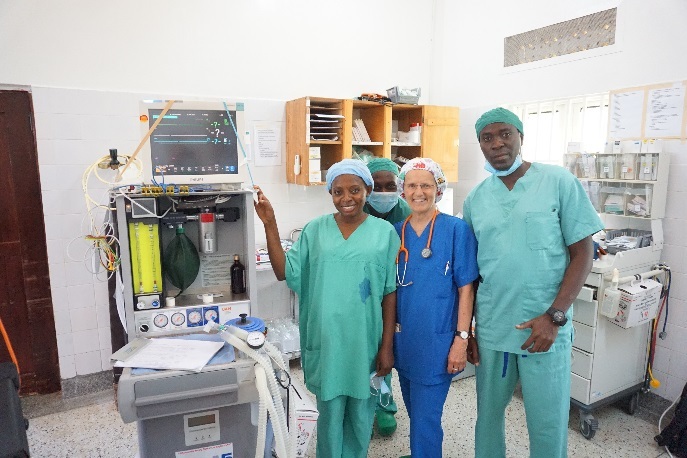 Significant progress has been made in the field of anaesthetics by the addition of the two anaesthesia workstations we brought with us and the arrival of a local nurse anaesthetist who is very capable and willing to learn. Thanks to the efforts of Philippe Besson and the support of the CHUV, we were able to bring these two machines with us. The combination of personnel and machines enabled us to operate in a far less stressful manner (as a back-up, we kept two other workstations in Fribourg). Preoperative guidelines have been developed with the collaboration of the staff on site. With regard to instrumentation, Kastriota, (called Nota), can be very proud of the training work she did. From a member of the nursing staff she developed a competent instrumentalist nurse capable of assembling ready-to-use surgical sets. Radiology was also a part of the mission: in just a few days Samuel Grenier had to teach three people how to use the equipment. He also had to try to repair the supporting structure of the X-ray machine and also assemble the automatic film developing machine. The promise of having superb x-ray pictures now looks set to become a reality! 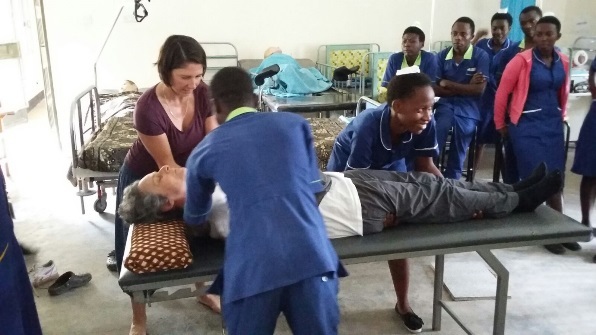 The novelty of this mission was the introduction of Physiotherapy by Joanne Foschini. She more than fulfilled our expectations and introduced a field of medicine that the staff of the hospital would like to develop. She taught nursing school students and on-site staff how to protect their backs when moving patients with disabilities. 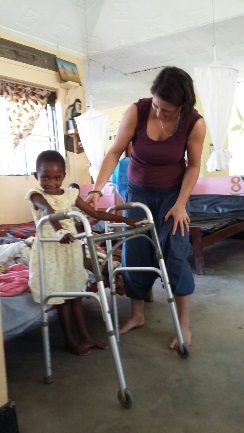 She taught two nurses the basics of physiotherapy as well as post-operative care, the care of ambulatory patients, sick children, and children suffering from cerebral motor diseases, and last but not least, how to fabricate crutches for children. 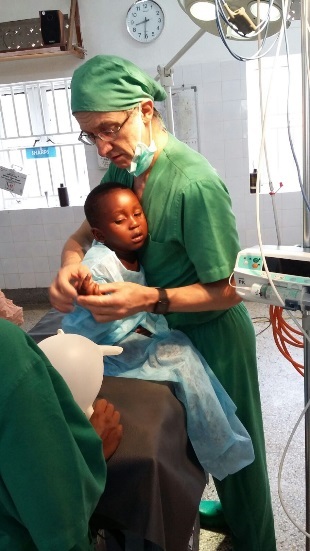 After examining nearly 100 people and thanks to the financial contribution of the American organization Watsi, 26 patients benefited from surgery ranging from sequestrectomy, osteotomy, arthrodesis, external fixation and debridement. Cases of osteomyelitis were predominant, mostly in severely disabled children with unusable limbs, many benefited from restorative surgery. 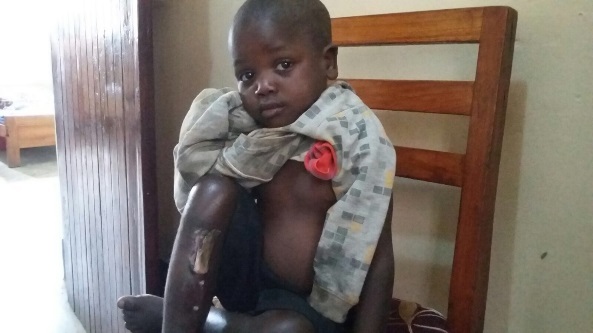 One of the children who particularly affected us was Darius, a five year old, he came for a consultation with an open fracture of the tibia. The bone was prominent, like a piece of wood stuck in his leg, it had been treated according to local custom,that is to say by herbal concoctions. The visible bone fragment was dead and was removed, under anaesthetic, just as one would remove a very large thorn. During this mission we were struck by the progress that has been made: the organisation was impeccable, added to which was the arrival amongst the personnel of four newly graduated nurses from the adjoining school. It was a pleasure to work with these young people, who are motivated, educated and very effective in the operating theatre, in physiotherapy and in radiology. 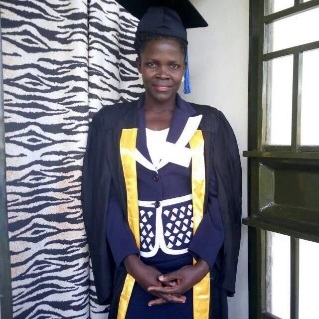 Lucy, the nurse whom we sponsored for her three years in nursing school, graduated with honours and the highest notes in all of Uganda. We are very thrilled and very proud of her achievement! We took advantage of this visit to review projects already in progress and those for which there is a need. The planned extension of the operating block requires some modifications and supervision by someone capable. We hope we will obtain the collaboration of an American volunteer, known and appreciated by all, but whose presence is still uncertain. We hope to start work in May. The radiology equipment needs a repair job that could not be completed during our stay, so we need a return visit from our favourite engineer, Mr. Philippe Besson from Philips. There is an urgent need for development of the laboratory by the addition of a bacteriology unit. Patients are currently receiving random antibiotic therapy which is most likely infrequently adapted to the infecting bacteria since they are not identified before treatment. 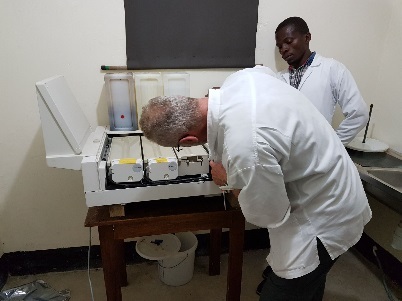 With additional equipment this laboratory could also be used, for the teaching of cytology, in particular in cervical cancer screening which is also an important project. Cervical cancer is very frequent in Uganda and the additional equipment would save money, not to mention lives (young women and mothers) since complementary therapies such as chemotherapy and radiotherapy are not available and also too expensive. A purely medical mission has to be considered, since time spent on medical cases is limited during surgical missions. It remains for us to find the funds………….